Whilst my last portrait (#28 Ramon) was all about staking out a background, Sabrina’s portrait was unplanned. She was checking her phone at a road crossing, and her amazing swirls of hair and scarf demanded an approach. She was fantastic to work with and patient whilst I tried to grab a background from what was immediately available. She’s from the West Country originally, living in London and investing her Sunday in an exploration of the East of town. 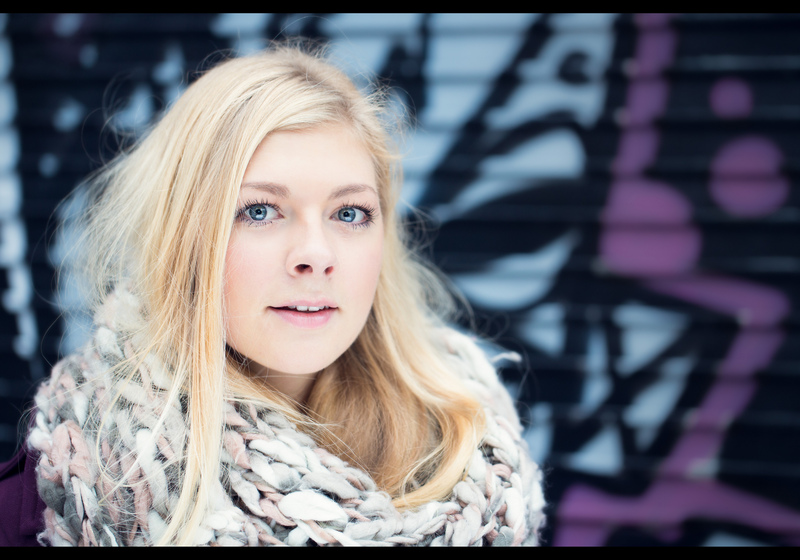 Hopefully the street portrait added rather than detracted from the experience – thanks for stopping, Sabrina. In terms of this shot there’s a couple of details worth noting – firstly the giant silver reflector she’s holding to tame the direct (though still pretty soft) sunlight. Secondly I made a few mistakes with the background, probably; that purple started off lurid pink, but I tweaked it in Photoshop to match her coat. There’s probably more I should have done in and after camera to make it less angular – the hard lines and points are so out of harmony with the soft curls of hair. Oh well… sorry! This is portrait #29 of my 100 Strangers Project – check out the group page and get involved.